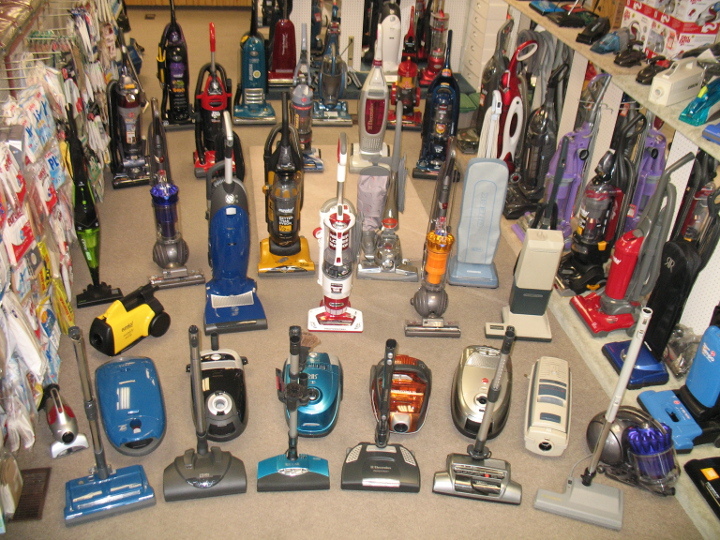 We carry over 80 new vacuum cleaners. We carry over 80 new vacuum cleaner models plus we make our own Handy Andy's Quality Vac™ Vacuum Cleaner brand, the best new vacuum you'll ever own! We sell all types and styles of vacuum cleaners: canister, upright, central vacuum, backpack, commercial, heavy duty, bagless, bagged, including lightweight, small, compact, portable, quiet, hepa filter and anti-allergy vacuums. We invite you to come in and tell us what you need and expect from your new vacuum cleaner and we'll help you pick the right one. You've probably seen many new vacuum cleaners advertised. You might already have a particular one in mind. We carry so many different vacuum cleaners, we should have the one you're looking for in our store. New vacuum cleaner ads and vacuum cleaner infomercials talk about amazing new technologies, features and designs. You might wonder which ones really do work best? You can see all those new vacuum cleaners in our store and we can answer any questions you may have. Your expectations of performance and reliability as well as design and function are just as important to us as they are to you. We know all the new vacuum cleaners inside and out from our own experience as well as from our customers experience. Please come in and talk with us about vacuum cleaners. 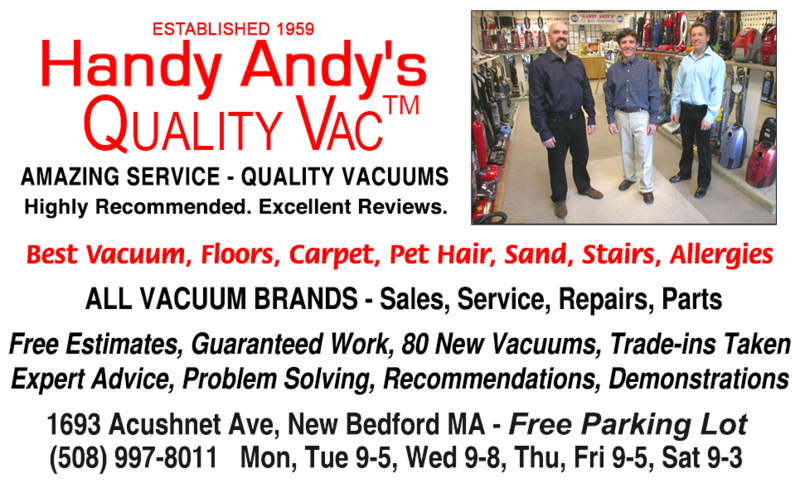 Why do business with Handy Andy's Quality Vacuum Cleaners? Because we are experts in new vacuum cleaners and have the best service. Because we have the experience from being in business for over 60 years. Because we care for our customers and have generations of loyal satisfied customers. 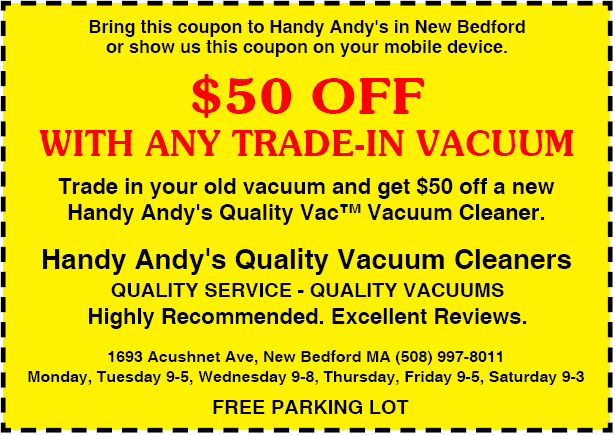 Because Handy Andy's Quality Vacuum Cleaners is a trusted, well known, family owned and operated local business. If you are one of our many long time customers, we thank you very much for your continued business, support and referrals, if not, we would love to have you as a new customer. Please stop in today and see what we can do for you. WE ASSEMBLE YOUR NEW VACUUM CLEANER. WE COVER THE MANUFACTURERS WARRANTY. WE TRACK YOUR PURCHASE DATE, WARRANTY AND SERVICE RECORDS FOR YOU. WE PROVIDE A 10 DAY MONEY BACK GUARANTEE ON ALL VACUUM CLEANER PURCHASES.